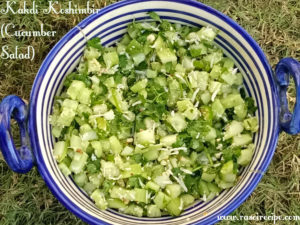 Kakdi Koshimbir is a healthy and quick cucumber salad recipe. 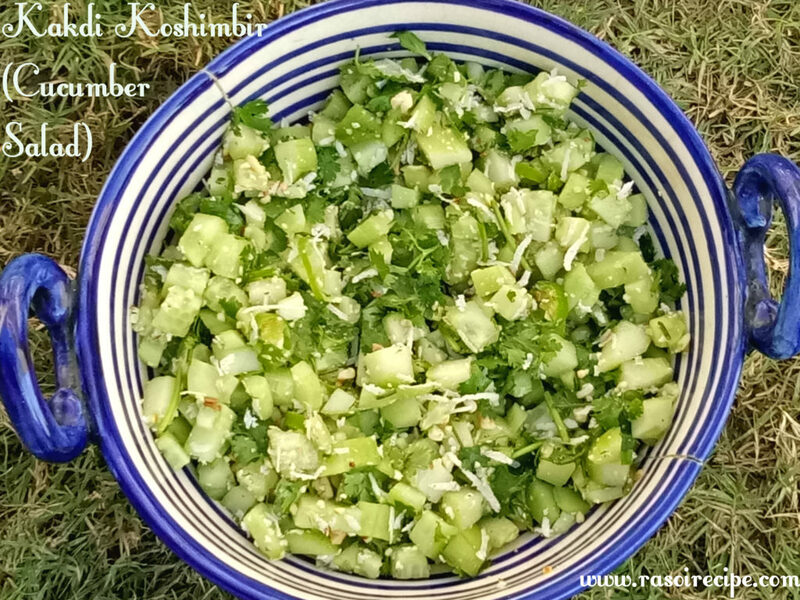 It is a very popular salad recipe of Maharashtrian cuisine. If you love healthy and delicious salad, this recipe is for you. Other name for this recipe is kakdi khamang or kakdi chi koshimbir. All you need is 15 mins to prepare this salad. Main ingredients required for this salad are cucumber, fresh coconut, roasted peanuts and coriander. If you are on a raw vegetables diet, this salad is perfect for your diet plan. You can have this salad as a snack also. Enjoy this salad in every season. No oil is required as a dressing. For Maharashtrian recipes you can check Peanut Ladoo (two ingredients recipe) , Sabudana Khichdi (Vrat/fast recipe) , Bhel Puri (Mumbai Bhel Puri / Spicy Puffed Rice) , Koshimbir with Yogurt (Maharashtrian curd salad) , Aloo Vada (Potato dumpling/ Batata vada) . Wash all the vegetables properly. Dice cucumber and chop coriander leaves. Grate fresh coconut. Roast and crush peanuts. 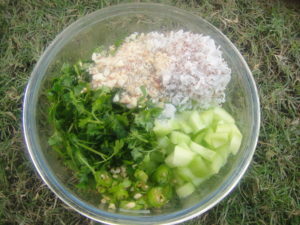 In a bowl add cucumber, coriander leaves, coconut, peanuts, salt and lemon juice. Kakdi Koshimbir is ready to serve ! Wow, such an easypissy salad recipe. I love cucumber but here I have to search for coconuts! Thanks for the recipe. Liked it. It looks so fresh and delish! I love making cucumber salad!